Meltem Muftuler-Bac organized two major events for the Viaduct project in the week of March 18, https://www.viaduct.uni-koeln.de , at Sabanci University to which Sabanci University is participating as a consortium partner. These two interconnected events were a PhD Workshop co-organized together with Frank Schimmelfennig from ETH Zurich and a two day conference with a wide participation. Detailed information on both are below. 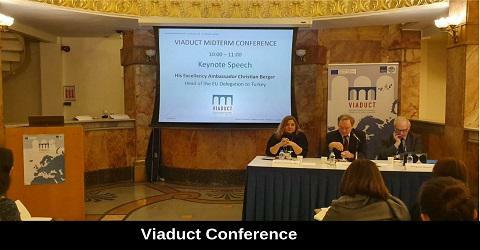 Meltem Muftuler-Bac organized a conference for Viaduct, a European Union funded project under the coordination of University of Cologne. The conference was held in Minerva Han, Sabanci University on March 20-21, 2019 where over 60 academics, policy makers and students from various European and Turkish institutions discussed the current state of affairs on Turkey- EU relations, the future of Europe and teaching Turkish-EU relations, with a keynote from the Head of EU Delegation to Turkey, His Excellency Christian Berger. 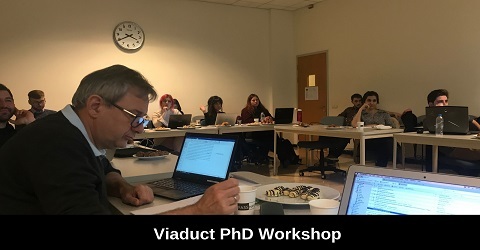 Meltem Muftuler-Bac organized a PhD Workshop together with Frank Schimmelfennig from ETH Zurich at Sabanci University under their joint project Viaduct on March 18-19, 2019. A total of 14 PhD students from Sabanci University, Turkish and European institutions presented their papers in the two day workshop, and attended keynote lectures delivered by Meltem Muftuler-Bac and Mert Moral from Sabanci University, Frank Schimmelfennig, ETH, Geoffrey Edwards, Cambridge University and Funda Tekin, University of Cologne.